New Zealand has declared a state of emergency as torrential rains lashed the country's South Island. As the situation continues to be tense, a bridge broke pieces and got washed away. 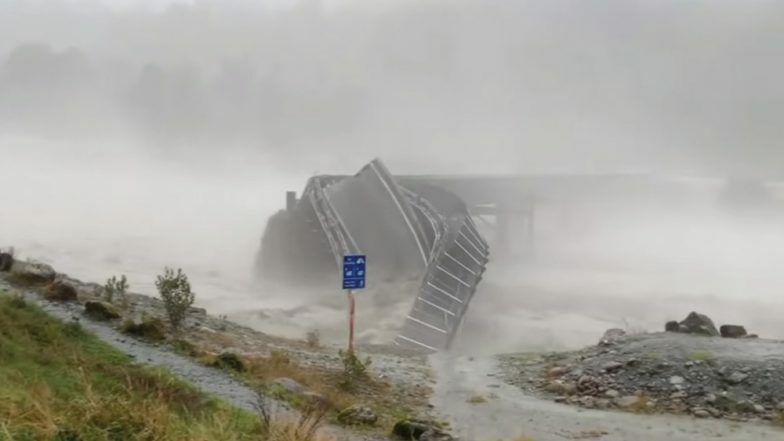 A video which caught the incident shows Waiho River Bridge, near Franz Josef, twisting and then eventually falling into the river. The bridge was left completely destroyed on Tuesday afternoon. It fell after floodwaters rose to 7.6 metres. The Waiho Bridge has similarly swept away in flooding three times since 2002. Roads in and around the region have been closed and residents were evacuated. Regional mayor Bruce Smith through local radio said, "This is a 100-year event, there is a huge amount of rain … I haven't seen all of the rivers impacted in Westland at exactly the same time." New Zealand's Meteorological Service said the storm was "a significant event even by West Coast standards". Pamela Adams, Operations Manager for St John Ambulance said that around 50 people are stranded in Haast and need accommodation. Groom Falls in Drain After Bridge Collapses Due to ‘Baraat’ Dance in Hoshiyarpur Village of Noida. Westland Mayor Bruce Smith declared a state of emergency and said the storm is expected. About 50 people who are stuck in the storm were staying at a makeshift emergency centre in a local hall until the storm passes. The Meteorological Service of New Zealand in a statement said that the storm was "a significant event even by West Coast standards". New Zealand Transport Agency has advised residents of the South Island's west coast to avoid travel until essential. Emergency services have been dispatched, in case people require anything urgently.